Sasza Blonder / André Blondel was an artist from the Krakow Group and the School of Paris. Marc Blondel, who unfortunately hardly met him, originated this website dedicated to his father. The website is an attempt to fill in the gaps in the painter’s biography, especially the Polish period, and to make him known to the public. It also aims at promoting his works in Art institutions – works that are scattered around the world in museums or private collections. This is not a commercial website. It is called after the artist’s two names: Blonder, his surname in his mother country Poland, and Blondel, the name he took in 1943 in France where he set up home. Polish expressionist painter from the School of Paris. Born on May 3, 1909, in Tchortkov/Czortkow (Poland, region of Ternopol, eastern Galicia, today Western Ukraine) in a family of Jewish merchants. 1926: first stay in Paris. 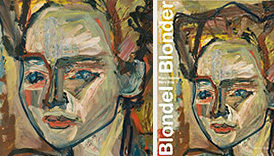 Book "From Blonder to Blondel (2009) Sasza blonder André Blondel"
From Blonder to Blondel (2009), South Act edition.